Places to see in Gopalpur on sea: The pristine beach of Gopalpur is the major attraction of the tourists. The beach is never crowded and sometime, especially in the afternoon you will not find another soul near the seaside, only a fisherman hauling his net out of the seawater. The beach is also admired by a Light House, which offers a panoramic 360-degree view of the entire Gopalpur including the sea and part of the Chilika Lake. You can enter the Light House, from 3:30 pm to 5:30 pm. A visit to the ruins of the ancient port of Gopalpur, upholding the lost glory of this pulsating port town is also an experience treasure. Nearby attractions around Gopalpur on sea: There are some amazing attractions nearby Gopalpur, beckoning the tourists. One of the most famous spot of tourist interest is the Taptapani hot spring. You can make trip to this enthralling location, famed for hot spring gushing from the earth surface. Bathing in the hot spring is truly an enduring experience. Taptapani is located 67 km from Gopalpur and takes an hour to reach by road. You can also organize a day tour to the Tibetan refugee village of Chandragiri, located 36 km. south of Taptapani. Another major destination is the Chilka Lake, the backwater of Orissa, located at a distance of 68 km. from Gopalpur. You can also visit the nearby beach of Dhabaleshwar. Things to do in Gopalpur on sea: Take a stroll along the quaint beach of Gopalpur and the expansive stretch of cashew nut groves, enjoying the sight of the rolling waves kissing the beach. Savor the spectacular sunrise on the azure seawater. The sight of the truant crabs running to and fro is also enchanting. You can also buy some handicrafts and hand-woven saris from the destination. How to reach Gopalpur on sea: There are a number of options to reach Gopalpur. You can drive to the destination along the National Highway 5 from Berhampur or Brahmapur, which is located 16 km from Gopalpur. You can also board a train from Berhampur. The Bhubaneswar airport, located at a distance of 180 km. 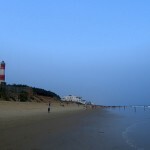 from Gopalpur-on-sea is the closest airport from Gopalpur. It takes one hour to reach Bhubaneswar from Kolkata by flight. Best time to visit Gopalpur on sea: The ideal time of visiting the location is monsoon, which initiates from mid-June to late August. Gopalpur buzz with tourists during this time. Lodging and dining facilities in Gopalpur on sea: There is an array of accommodation facilities in Gopalpur. Prior booking of hotels is required only during the high tourist season of November-January. However, the town remains idle for the rest of the year. Photographs by Debkinkar Baidya, Avik Chatterjee.